So here is new obsession. I am still tweaking my way of noting things on the sheet on the right, so as it evolves I will share. this my dear friends is a Moleskine Large Weekly Planner. 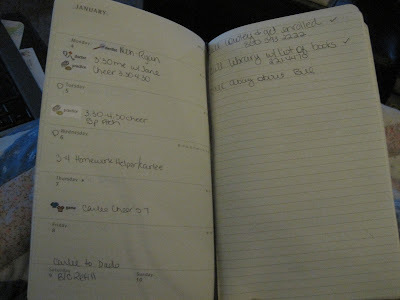 As you can see by the first picture it is the outside generally they are basic and look like this http://www.amazon.com/Moleskine-Weekly-Notebook-Month-Large/dp/8862930518/ref=sr_1_1?ie=UTF8&s=books&qid=1263099374&sr=8-1 So I am a scrapbooker did you expect for it to stay plain long? NAAA! SO there for the end result. A button and some rub ons and we ar ready to go. Next in the back I created 1 page dedicated to "Books to Read" and "Movies to see" with 2 tabs that I had from a Heidi Swapp kit. 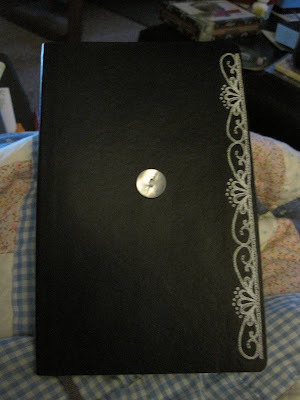 These have an accordian pocket in the back so I have a small address book slid into it. The reminder stickers are from http://search.barnesandnoble.com/Family-Facts-Calendar-Sticker-Pack/Pam-Socolow/e/9781402762963/?itm=2&USRI=stickers+family they are ok but I have several sheets I wont use like "car pool" but its all good. After researching some hacks I used my handy dandy We R Memory Keepers Crop A Dile to make inverted circle to create a tab like a dictionary for each month. I am trying now to get through the book "Getting Things Done" parts of it are handy for me so I am pressing on. I have several books I never finished BUT NEVER an organizational type one and I WILL NOT let this one beat me!